The official website of Malaysian Airlines has been hacked and defaced by Cyber Caliphate, the ISIS supporting hacking group. Visitors on the Malaysian Airlines website malaysiaairlines.com currently can see deface page along with a message rather than the original site content related to flight booking schedule. The hackers also changed the website’s description to ISIS will Prevail message. The reason why the group hacked Malaysian airlines website and connection between Lizard Squad who hacked Sony and Cyber Caliphate is still unclear. (The deface message includes names of groups like Lizard Squad and UGNazi). 404 – Plane Not Found Hacked by Cyber Caliphate Greetz 2: Lizard Squad, UGNazi, NATHAN NYE HENRY BLAIR STRATER, according to the deface message. Cyber Caliphate are the same hackers who last month hacked official Twitter account of United States Central Command (Centcom). 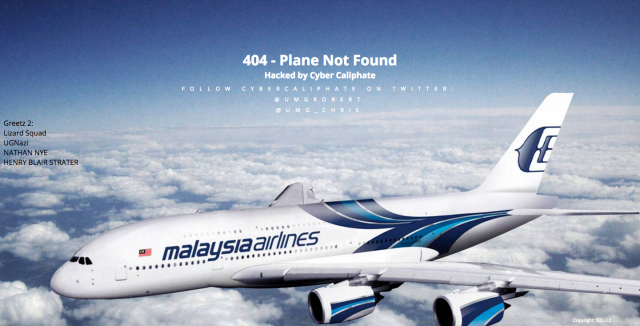 At the time of publishing this article, the Malaysian Airlines website was hacked and displaying deface page left by the hackers.